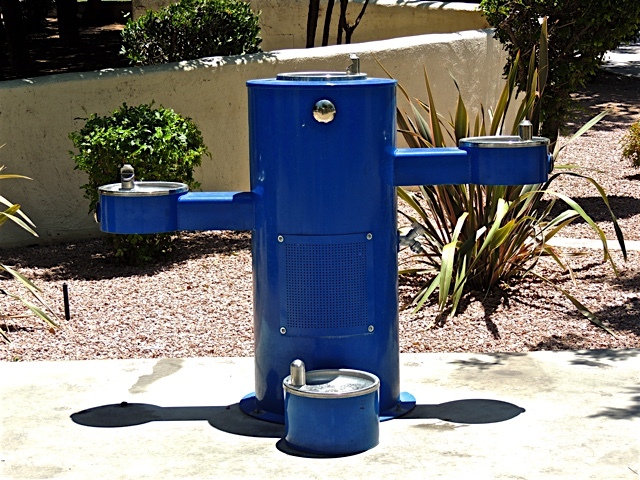 I love these water fountains located in the park around the Scottsdale Civic Center. They are built to accommodate adults, children, people in wheelchairs and even our four-legged friends. They certainly are a welcome sight at this time of year when no one goes anywhere without taking water with them. 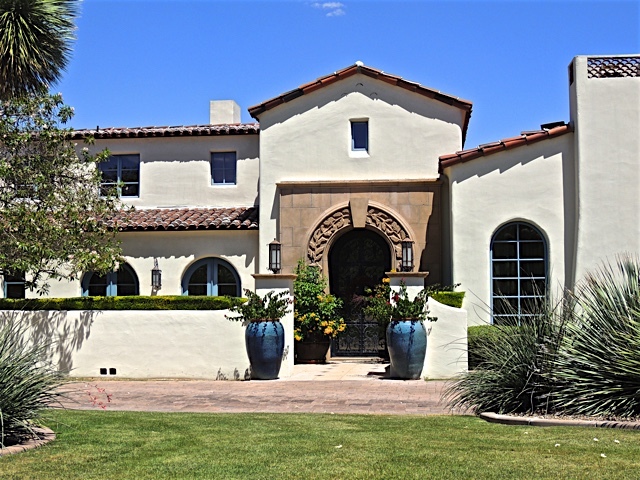 The homes I'm featuring today are from the same area of Paradise Valley that I explored in yesterday's post. 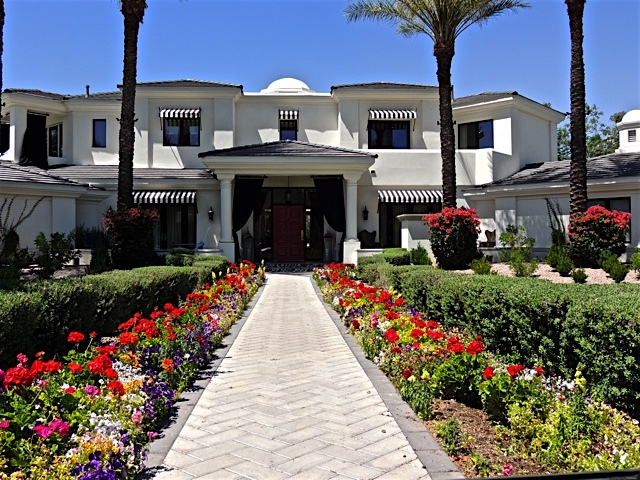 The one above is certainly palatial with stunning landscaping and those striking striped awnings. 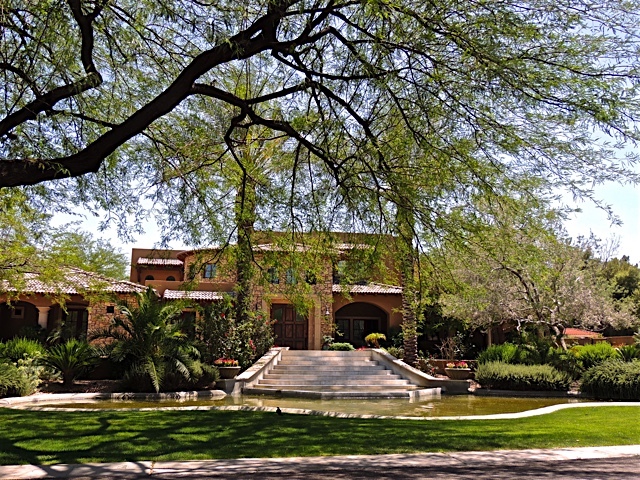 This colonial style house looks a little out of place in a desert environment to me. It looks like it would be better suited to some place on the east coast. 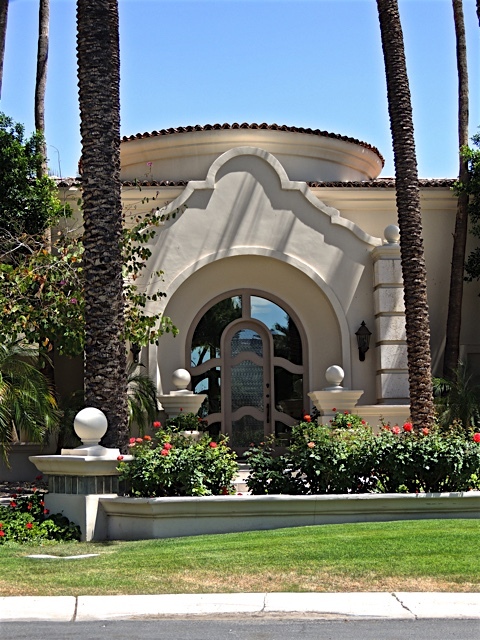 This one has a rather dramatic entrance with that fabulous glass door surrounded by arches. I love it when I stumble on to areas that are completely new to me. I'll have to do some more exploring during these hot summer months when I can explore from the comfort of my car. 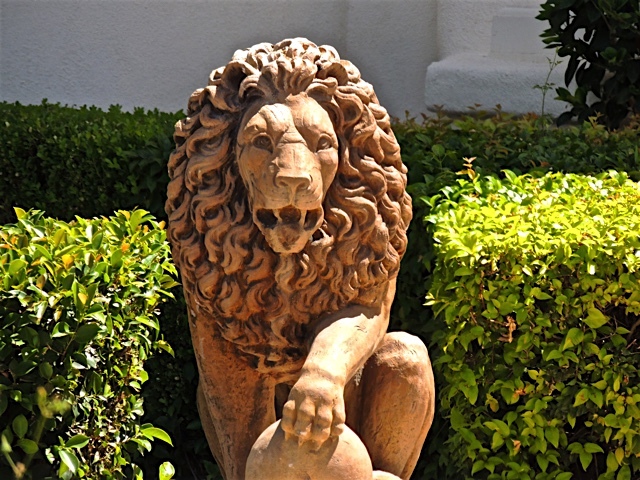 A few days ago I posted some lions I found roaming around Paradise Valley. 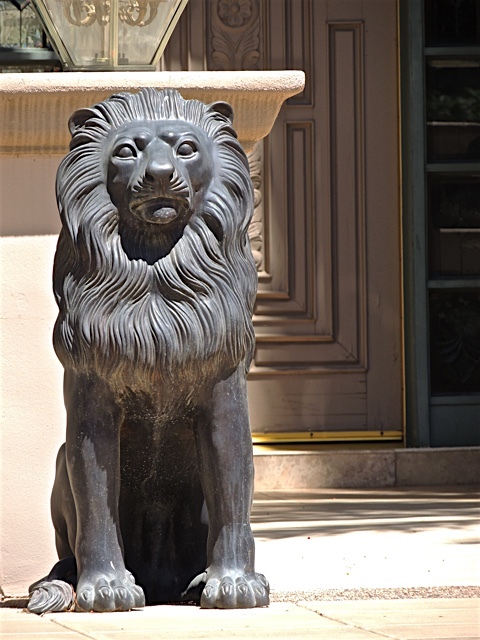 I found those lions by exploring in an area of the city that I hadn't visited before. 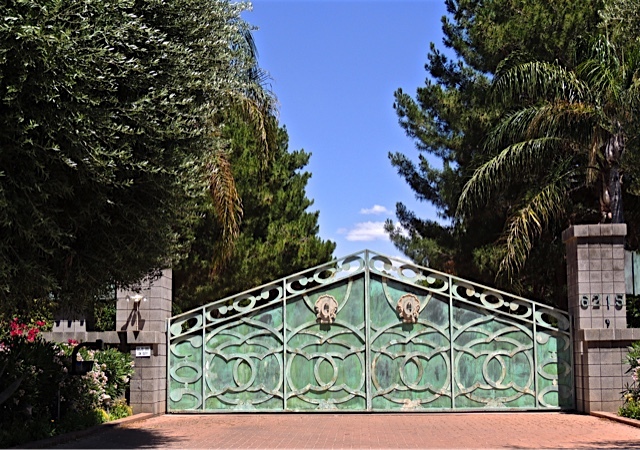 I found some huge estates worthy of all those lions. In fact, the one above features two of the lions I posted a few days ago, the one standing tall and the one sitting on the post. You can see in this photo that the one standing tall had a twin on the other side of the entry. This house didn't have any lions but, it did make up for it in very large pots overflowing with flowering plants. This home has its own lake in front. It sort of made me think of a moat around a castle and it's certainly large enough to be castle-like. I have no idea what this home might look like. The rather formidable gate blocked any view beyond. However, that block fence makes me think of a Frank Lloyd Wright design. I have no idea if it is but, Wright did use that type of block in many of his designs. Tomorrow I'll show you a couple more from this area I explored. 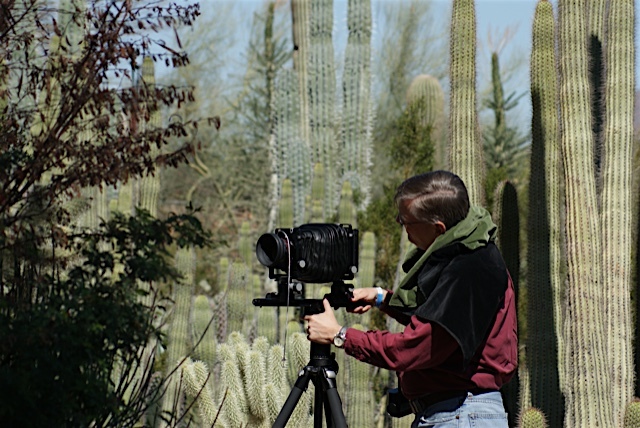 I went to the Phoenix Art Museum last week to see an exhibit of photos by David Taylor. 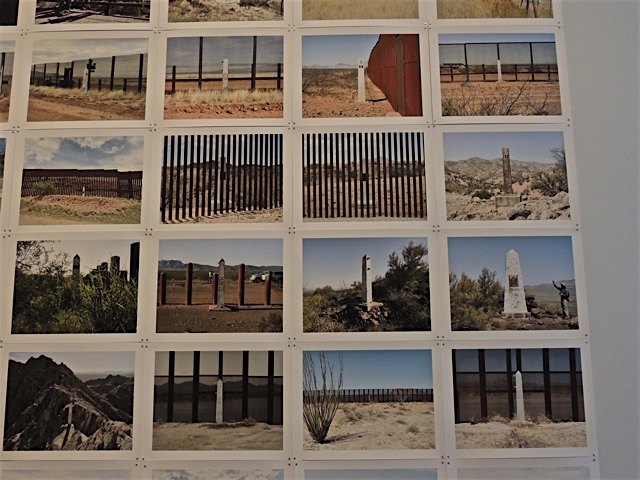 Between 2007 and 2015, Taylor worked on a project to photograph all 276 of the obelisks that mark the border between the United States and Mexico. Working between El Paso Texas/Juarez Mexico (where the border leaves the Rio Grande river and moves across land to the Pacific Ocean at San Diego California/Tijuana Mexico. The obelisks were put in place during the 1890's by the International Boundary Commission and they were documented then by photographer D. R. Payne. 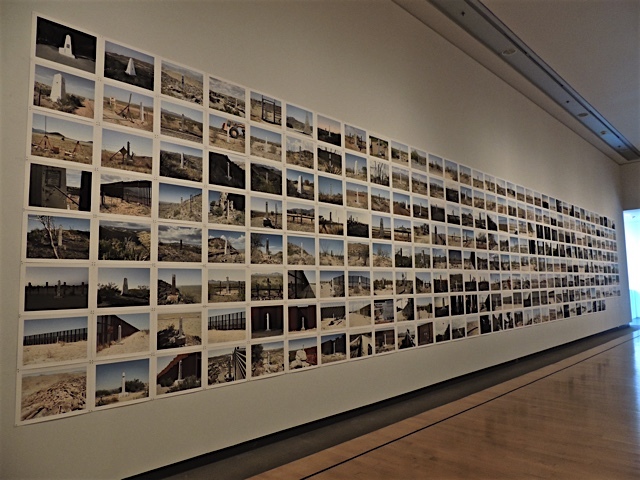 In 2015, Taylor published a book with pictures of each obelisk in numerical order and this exhibit also includes all 276 photos along the wall above. It was fascinating to see how the terrain changes and how some obelisks are now surrounded by border walls and fences while others in rougher terrain are still wide open. Above is a closer shot of some of the photos so you can get a better idea of how they look. Many people have called them 'mile-markers' but the placement was not measured that way. They were placed with consideration that they would be visible from each other. Most of them are between 2.5 and 3.5 miles apart along the 690 mile stretch from the Rio Grand to the Pacific Ocean. 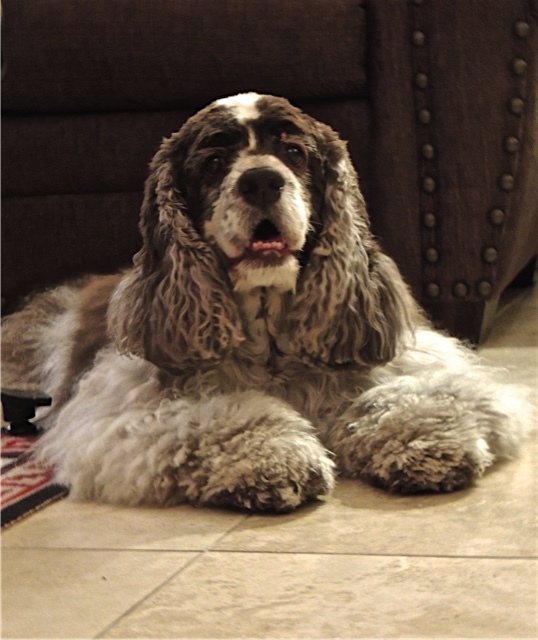 This is "Root", the twelve-year-old dog of some friends of mine. 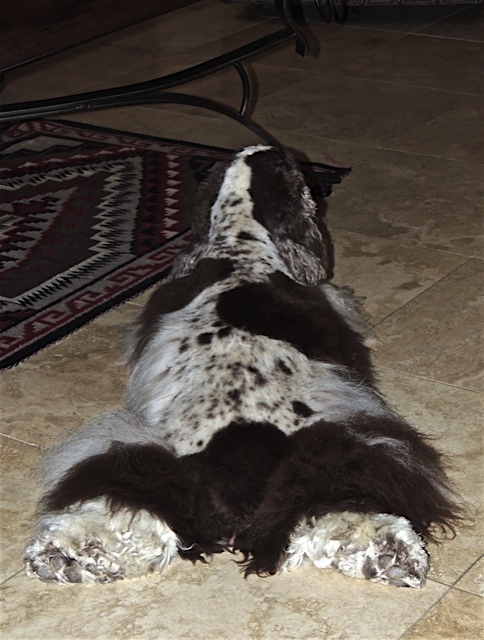 I took this photo of him sprawled out on the floor because I thought he looked like a cute dust-mop ready to go to work. Isn't he a cutie? My friends hosted the June meeting of our "Art Challenge" club and Root enjoyed having a big group of people around to give him some extra loving. I have a new post on Sharon's Sojourns today. The town of Cortina in Italy is on the agenda. 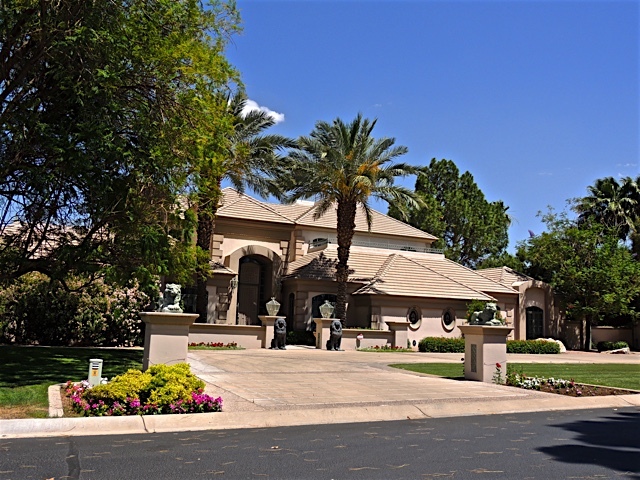 Yesterday I said I'd show you the most common yard ornamentation I see in the Paradise Valley area. It has to be the proud lion. 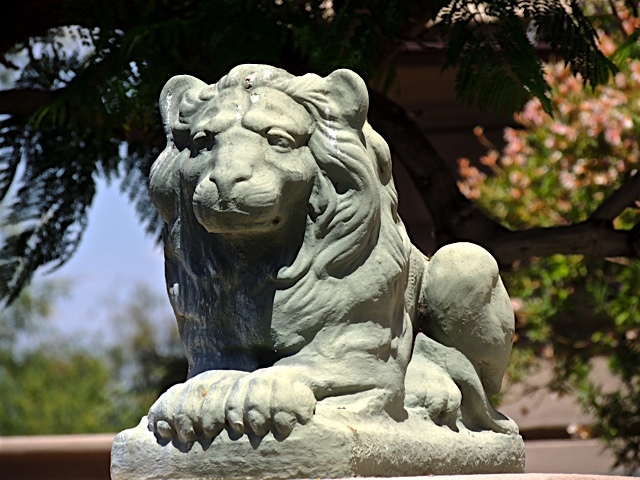 I see lions perched in a variety of places in front of many homes in Paradise Valley. This one is sitting tall and proud like a soldier on duty. This one is sitting atop a fence in a more relaxed position but still alert and watching what is going on in front of him. This one is looking very fierce with his paw on an orb and a little growl on his face. Even though they are outnumbered by lions, a horse or two also shows up in this area too. 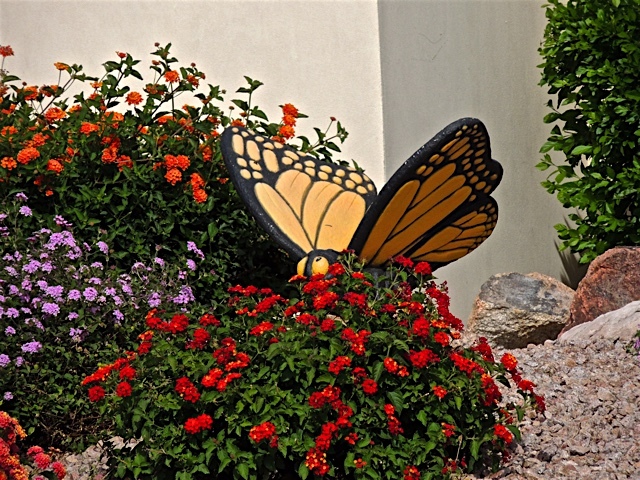 I found this giant butterfly lurking among the flowers in this yard of a home in Paradise Valley. It actually was a rather different sort of yard ornamentation for the area. Tomorrow I'll show you the most common animal I see sitting in yards in this part of the city. Last week I had lunch with my friend Glenda at our favorite watering hole, Zinc Bistro. When we each ordered a glass of Prosecco, the waitress asked if we were celebrating something. I said yes, we were celebrating one of life's little milestones (not the birthday kind). 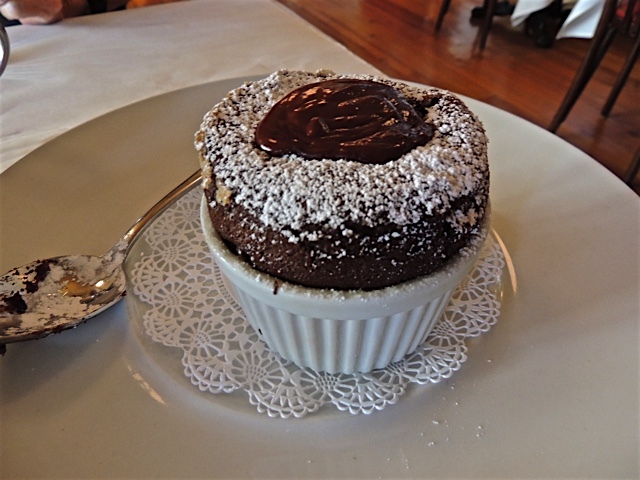 After we devoured our lunch, the waitress brought us a gorgeous chocolate souffle complete with a sparkler candle. Wasn't that sweet of her? Thanks Zinc Bistro, it was delicious. 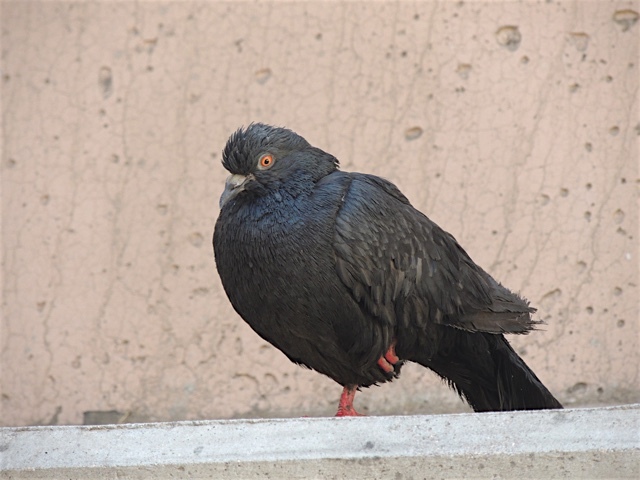 I was climbing the stairs in a parking garage when I spotted this pigeon sitting on a ledge in the stair well. He just sat there keeping an eye on me as I made my way up the stairs. When I rounded the corner on the landing I saw the "Mrs" sitting on a nest back in a hidden corner. 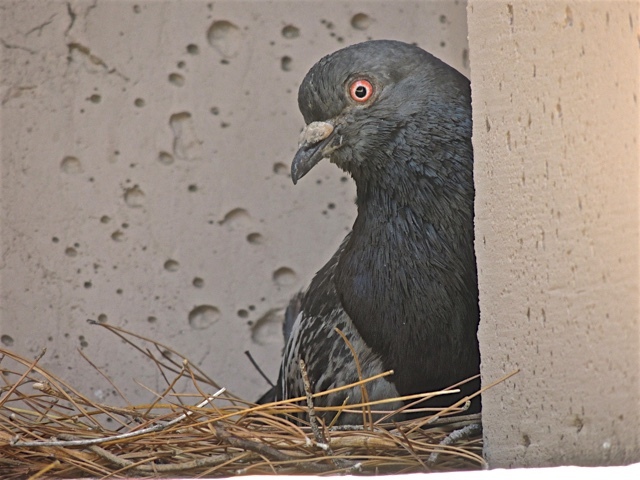 So I think Mr Pigeon was doing his domestic duty and watching out to keep the Mrs safe while she tends to her maternal chores. Just a little slice of the domestic side of wildlife. Since 1957 the Pinnacle Peak Patio has been serving up mesquite grilled steaks, their signature steak being a 32 ounce porterhouse. I've had the pleasure of dining there at least two times but both times were a very, very long time ago. The restaurant developed a reputation for snipping off the neckties of any gentleman who arrived formally dressed. 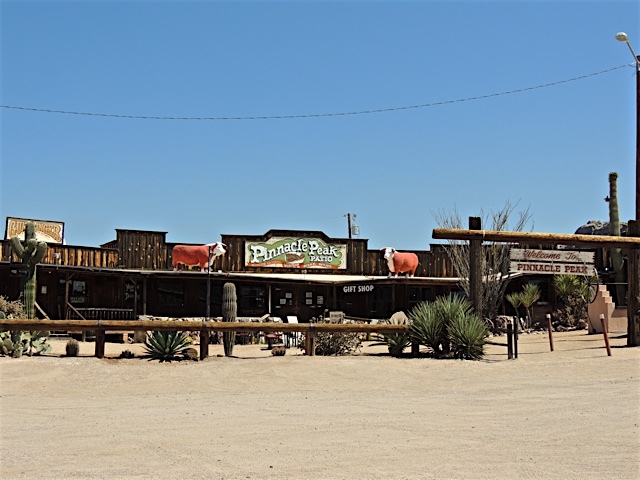 After all, it was a cowboy place, not a dress-up place. All those ties got tacked to the ceiling and there were thousands of them. As you can guess, guys wore a tie just so it could get cut off and left hanging in the restaurant. The property sold a while ago and the restaurant is now closed. There were a couple of other similar places in the north Scottsdale area but they all closed a long time ago. This was the only one left. The owners are supposedly looking for a new location but, I recently heard that an auction has been scheduled to sell off a lot of the restaurants memorabilia. That sounds to me like there might not be a new place after all. 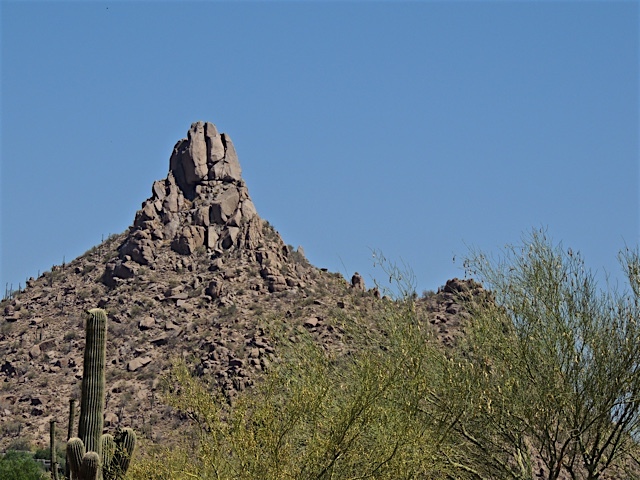 By the way, this is the near-by rocky outcropping that is called Pinnacle Peak that gave the old restaurant it's name. It's not going anywhere! 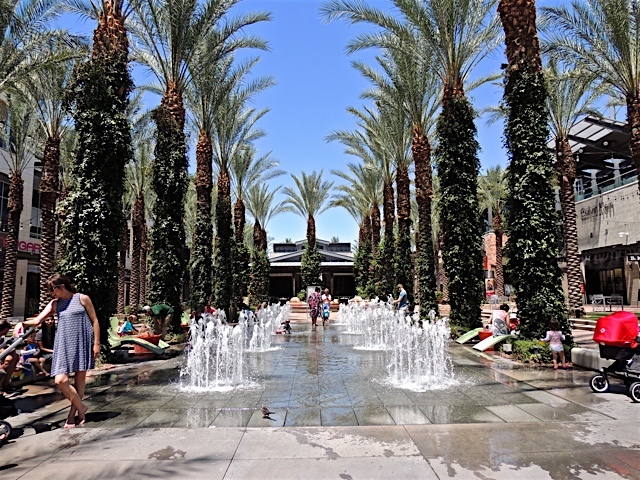 There was one feature at the Scottsdale Quarter that I didn't tell you about in yesterday's post. 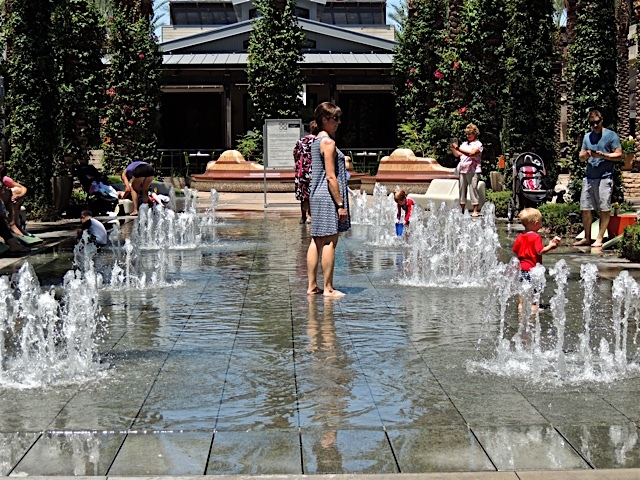 It's this splashy fountain area. It was very popular with mothers and very young children. 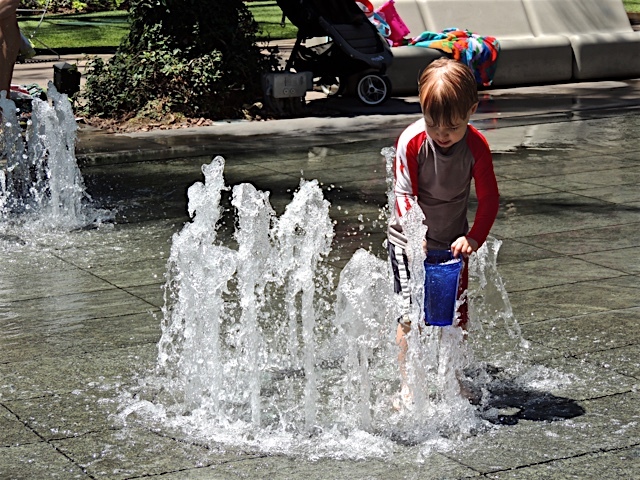 I actually sat down and watched the sheer joy on those tiny tots faces as they ran through the streams of water. I watched this young man fill up his bucket and then take it over to where his mother was sitting. There was another child who would sit in the circle of the water spouts when they were low to the ground and then wait for them to shoot up in the air all around him until he was almost hidden by the wall of water. I had fun just watching it all. 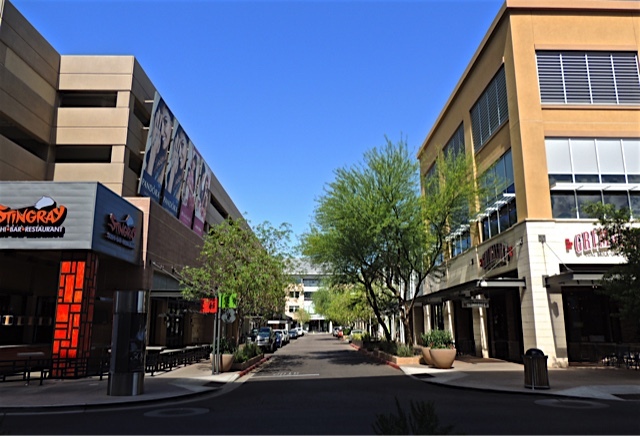 Last week I discovered a new shopping area in north Scottsdale that I had never visited before. It's been there for about four years but, I don't get up in that area very often and when I do, I always end up at Kierland Commons, a place I've featured here a few times. 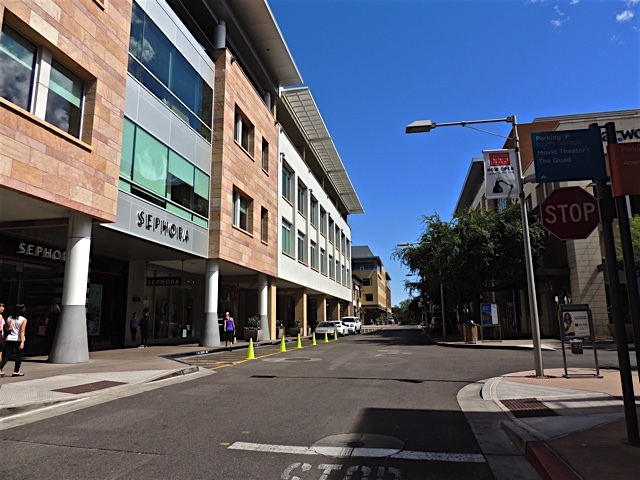 This place is called Scottsdale Quarter and it has a different look to it. It sort of reminds me of shopping in the heart of a city's downtown. All the shops face a street and a sidewalk. 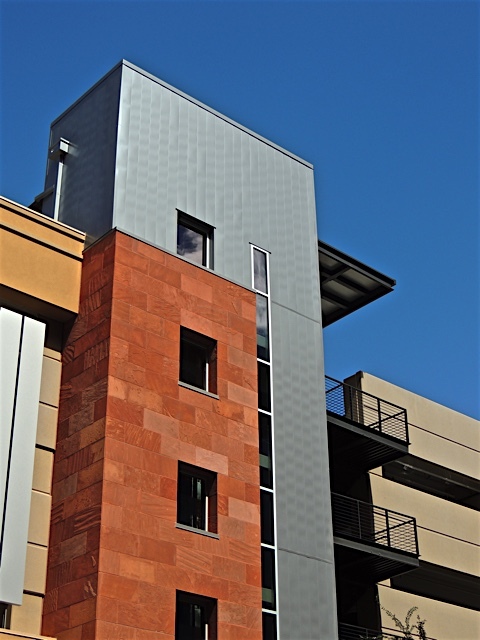 The architecture is modern and attractive and there is a bit of street parking but there are three big parking garages for patrons to use. That's a blessing in Arizona where any place to park the car out of the sun is a very welcome attraction. I enjoyed walking around and exploring the place. I found a few shops to browse and several restaurants to try. There was even an American Girl store which brought back a few memories for me. When I worked in Chicago in the late 90's the "American Girl" store was a new phenomenon to me. I quickly learned that mothers from all over Illinois and the surrounding area would bring their daughters all the way to Chicago just to visit this store and purchase a special doll for their child. I wonder if it's as big of a deal to young girls today as it was back then. I have a new post on Sharon's Sojourns today. There is a lot to see in the mountains of Italy. 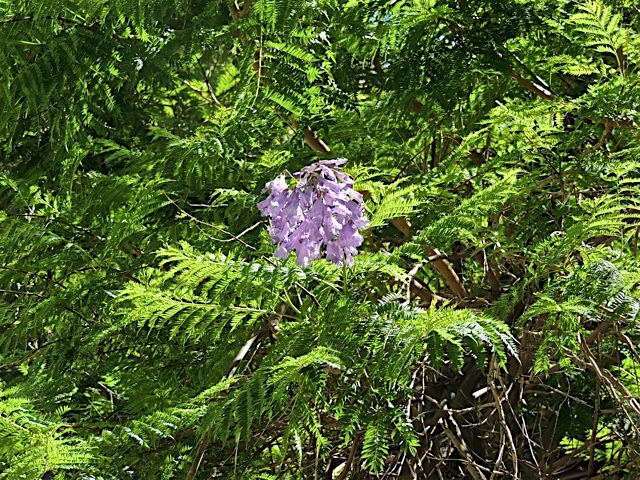 Just when I thought that I had seen the last of the lovely Jacaranda blooms for the season, I spotted this one right at eye level. I was on the 3rd level of a parking garage when I caught site of these lovely lavender blooms. They appeared to be the only ones remaining on this tree and they certainly have outlasted their normal season. 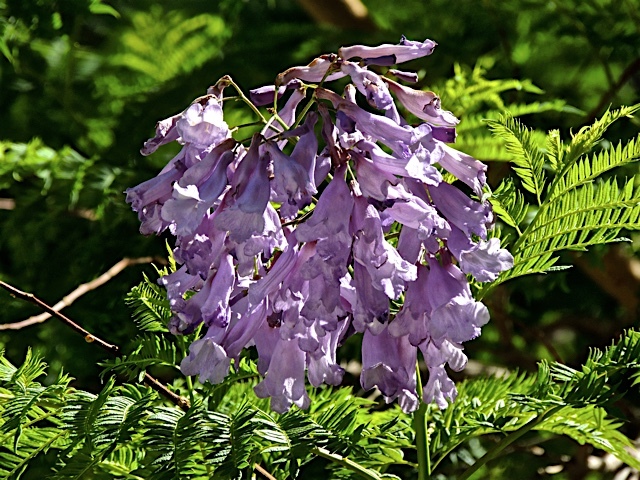 I hadn't seen any jacaranda booms since mid-May. I'm glad I got one more look at their delicate bell shaped flowers. 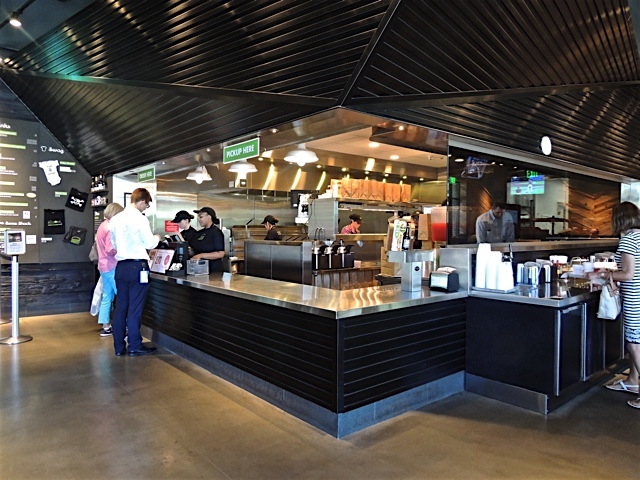 Remember last month when I featured the story about the new burger place called Hopdoddy? Well, I discovered that about the same time that Hopdoddy opened, another new burger place also set up business in the valley. 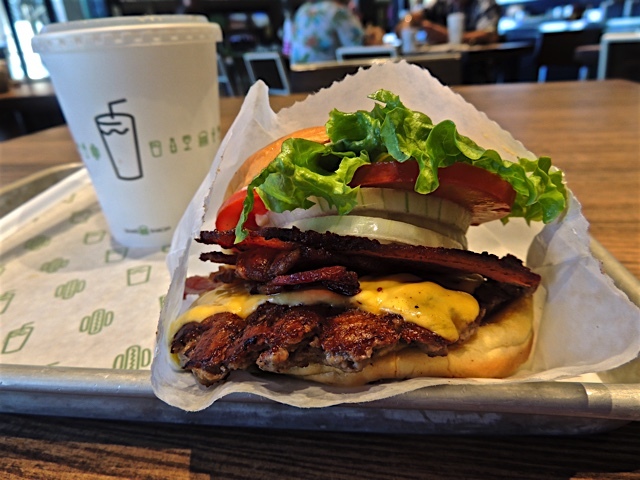 It's called Shake Shack. So, yesterday I had an opportunity to give it a try. Above is the burger I ordered. It was called a "smokeshack" because it has smoked bacon on it. I'm here to tell you there is no comparison. Hopdoddy has the far (and I do mean far) more delicious burger. This one had a much thinner patty, flavorless cheese and a rather pain-Jane bun. Their menu is rather limited too. They only have five burgers on the menu along with a chicken sandwich and a few hot dogs. And, their five burgers are pretty basic. Hopdoddy has eight very different and very creative burgers along with a club sandwich, a tuna burger and a vegetarian burger. In my book, Hopddody wins, hands down! What's even better is that Hopdoddy is closer to where I live. Win...win! 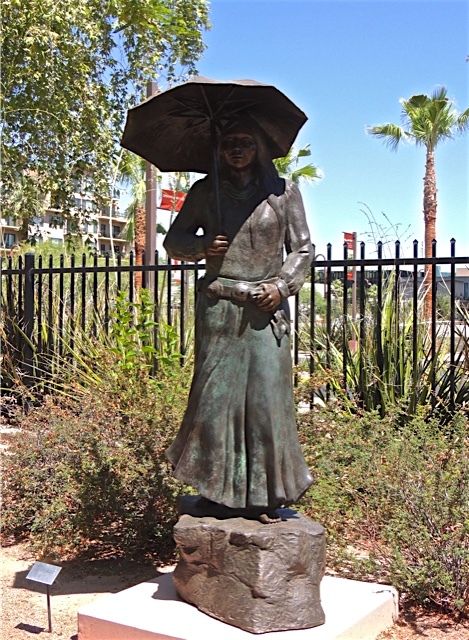 This sculpture sits in Old Town Scottsdale right in the heart of the gallery and souvenir shopping area. It's called "Blessings to All" by Elk Woman. 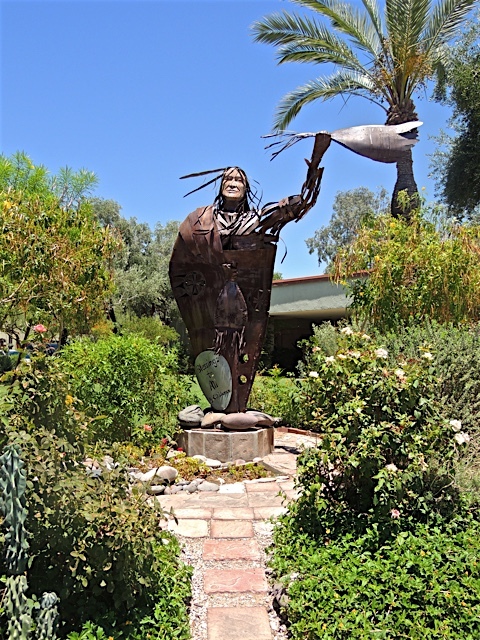 Elk Woman (Kathy Whitman) is a phoenix based artist who creates jewelry as well as sculptures. 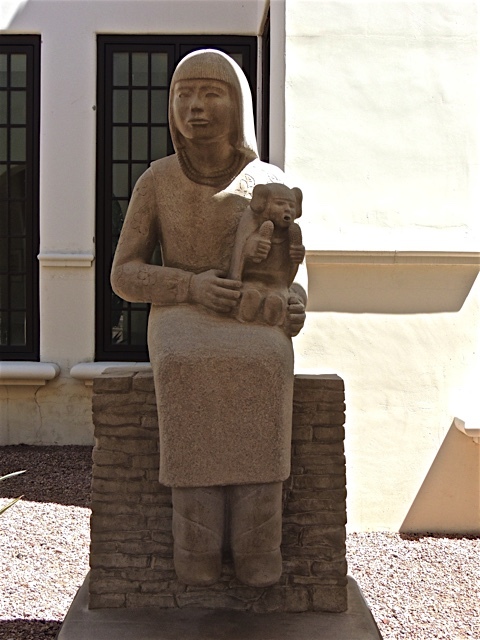 She currently has sculptures at a show at the Museum of Indian Arts And Culture in Santa Fe, New Mexico. 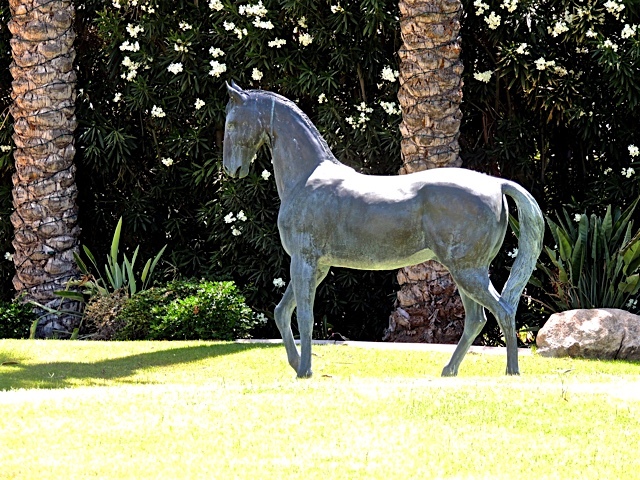 This sculptures is a well know welcoming sign in the heart of Scottsdale. Late last night I happened to check that National Recognition Day calendar and saw that today is National Nature Photography Day. I decided to change the post I had for today and dedicate this one to some Nature Photography. This guy looks petty darn serious about his nature photography. My camera isn't anywhere near as big as that one above but, I think it still does a fine job of capturing the beauty that nature has to offer. 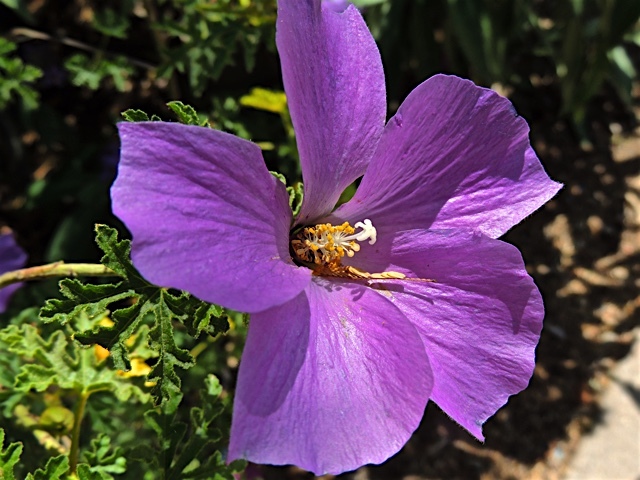 This blue hibiscus is a fine example. 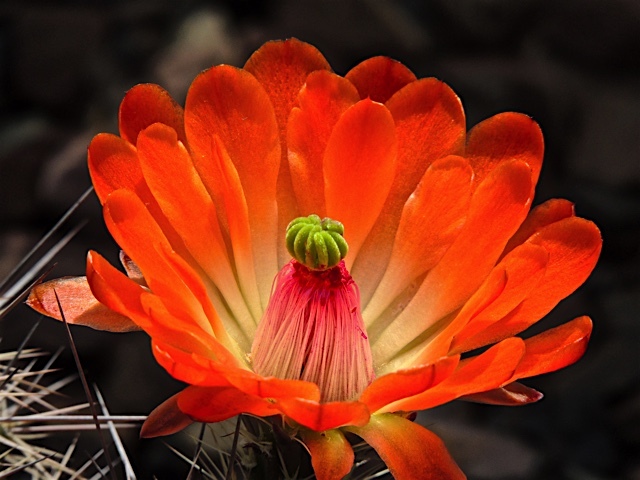 This claret cup cactus bloom is also looking pretty good. Go out and photograph some nature today! 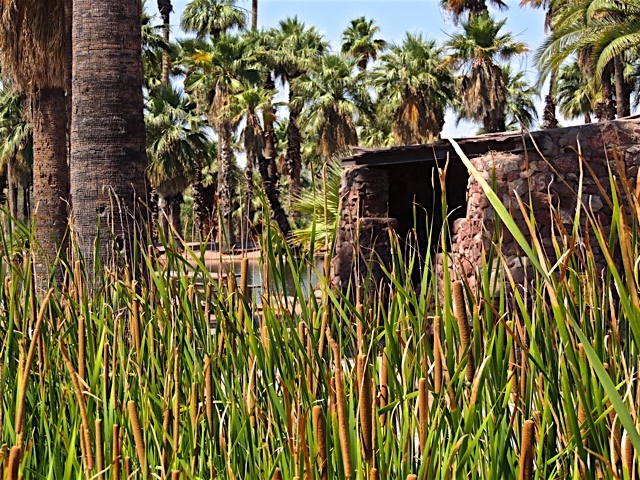 I took a walk at Papago Park Sunday morning before it got too warm. It was quite pleasant. Not too many people about. 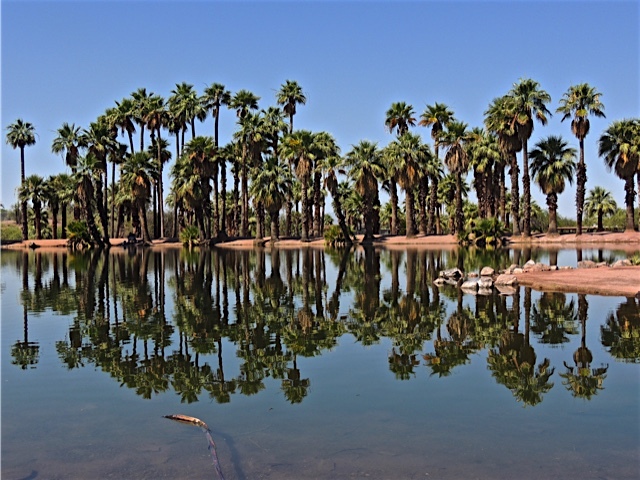 The lagoon water was very still so it made great reflections of the palm grove. The cattails were tall and seemed to be framing the picnic ramada. 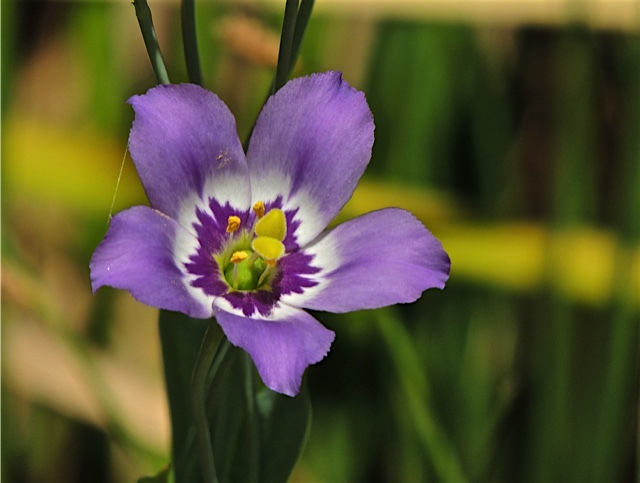 Those purple flowers I featured yesterday were blooming all around the lagoon. 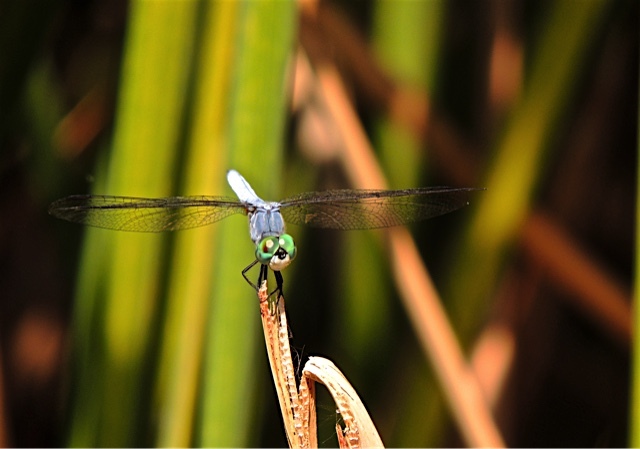 And the dragonflies were buzzing all around and keeping an eye on things. Doesn't this one look like he's smiling? I'm having a hard time finding the words to express my grief over yesterday's tragic event. The magnitude of loss is as overwhelming to me as the incomprehensible hate that generated it. My heart is aching......once again. 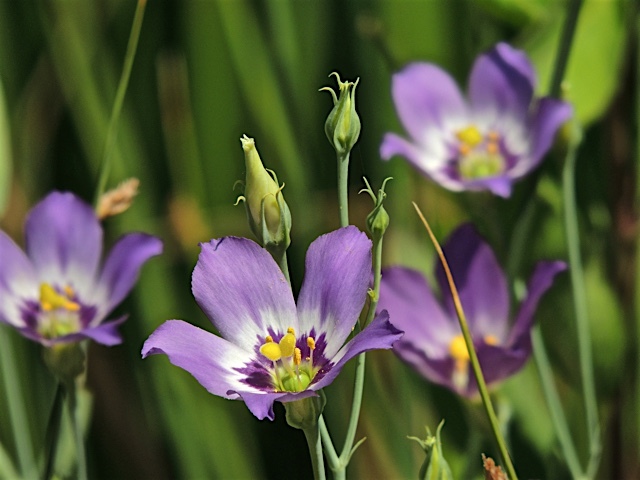 Photo: Some purple flowers I saw yesterday growing near the lagoon at Papago Park. Yesterday I featured two bronze sculptures by artist Doug Hyde that are located at the Heard Museum. Those two aren't the only of his sculptures on display. Today I have three more to admire. 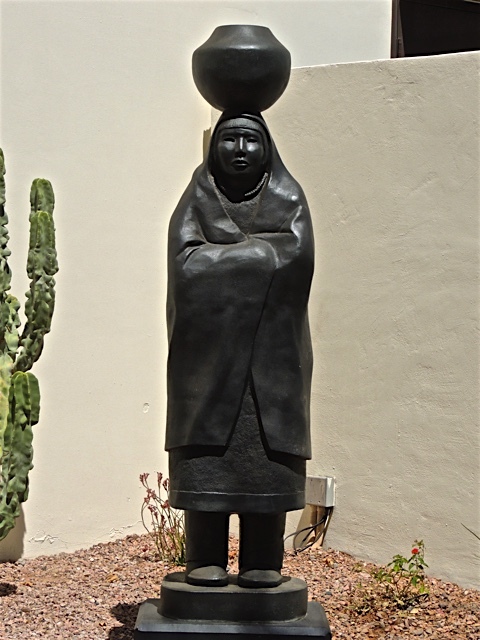 This first one is titled "Zuni Girl". It is a beautiful bronze with very smooth lines and a traditional look. Doug Hyde doesn't only sculpt in bronze, he also uses stone and these two are also his works. The grouping is titled "Flag Song" and it's sculpted from Tennessee pink marble. This last one is also by Doug Hyde, this one sculpted from limestone. It's called "The Dollmaker". 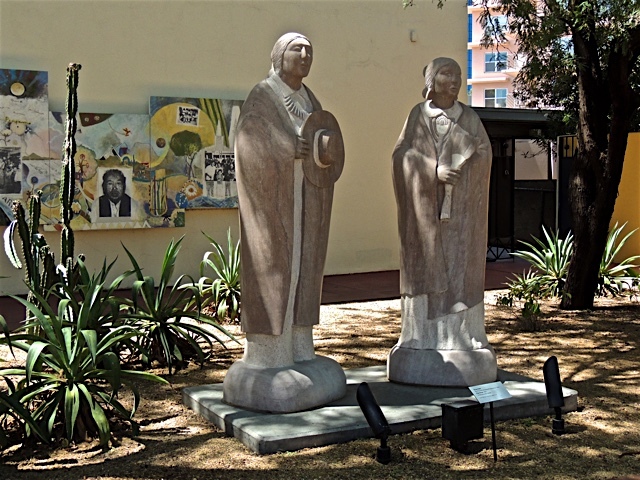 All of these sculptures are located around the grounds of the Heard Museum and can easily be seen by anyone who stops by the museum. I have a new post on Sharon's Sojourns today. I'm taking my very first walk around the streets of Rome. 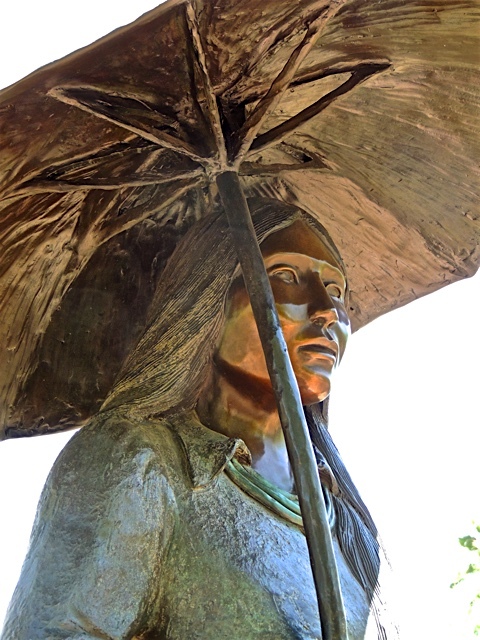 There are two of these sculptures on the grounds of the Heard Museum. Both are by artist Doug Hyde, another well known Native American artist in the southwest. On the day I was there, the sun was so bright, I didn't blame this young lady for shading herself. It looks completely natural. 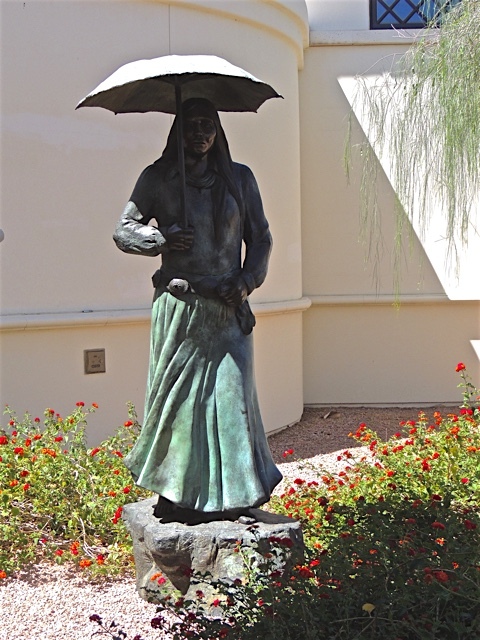 But, the title to the sculptures is "Southwest Summer Showers". Those happen too, especially in the northern half of our state. I had to get up close to get a shot of this young lady's face. That umbrella was doing a great job of shading her. I spotted this fellow on a palm tree in Tempe a while ago and had to get a shot. 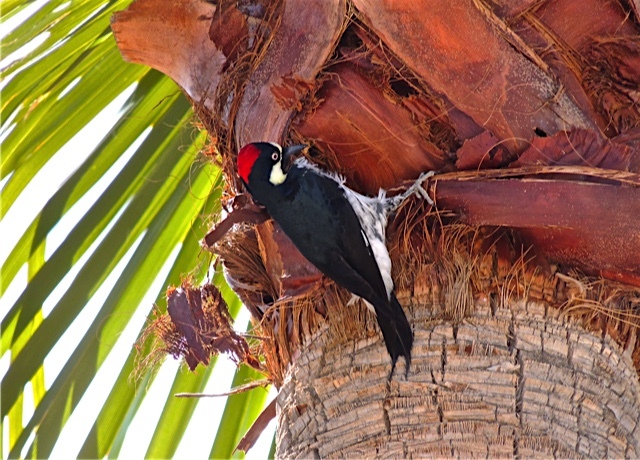 According to my "Birds of Arizona" book, it's an Acorn Woodpecker. I don't think I've ever seen one before. He's a handsome fellow. 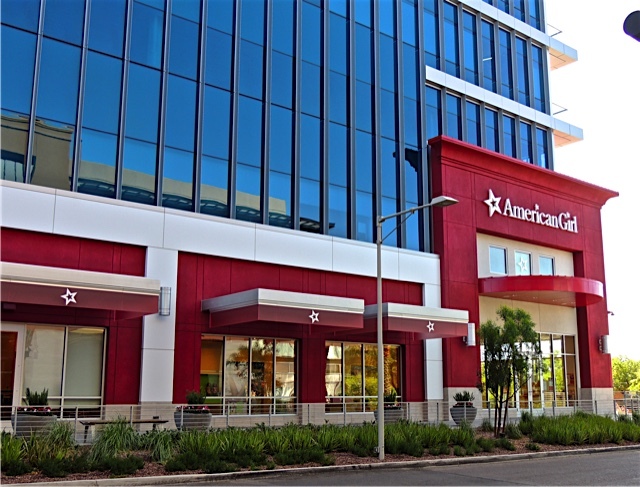 Around 10 years ago when I worked in Chandler Arizona, I had to drive by these two buildings every day to and from work. If it was dark when I was driving home, these buildings would be completely lit up inside and I always wondered why so many offices would be busy until so late in the evening. 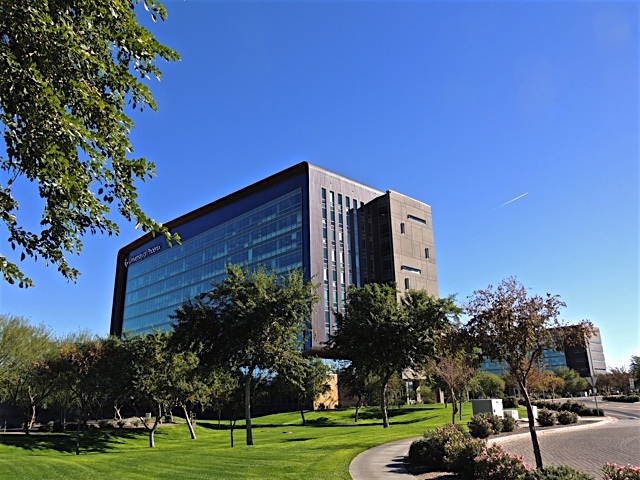 This is the headquarters for the University of Phoenix a for-profit education group owned by the Apollo Education Group. I'm sure most of you have heard of this school. They have 91 campuses world wide although that number is declining as they close some of them because of falling enrollments. Enrollment hit a high of 600,000 students in 2010 but, is down to 162,000 in 2016. These two buildings are listed as the corporate headquarters. 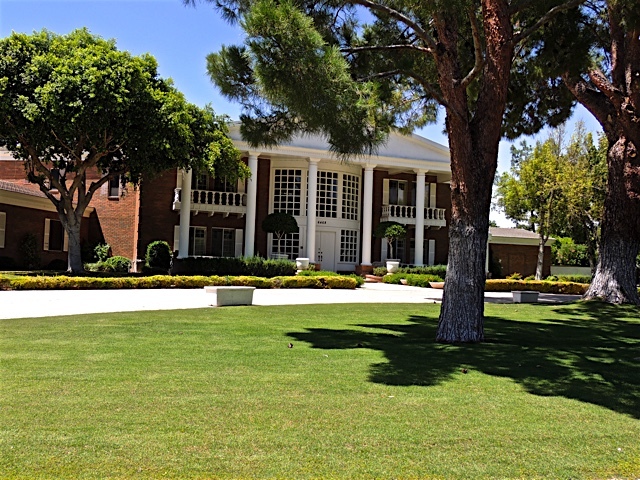 There are a few other large buildings scattered around the valley that are called "campuses" however, most of the schools classes are taught on-line.